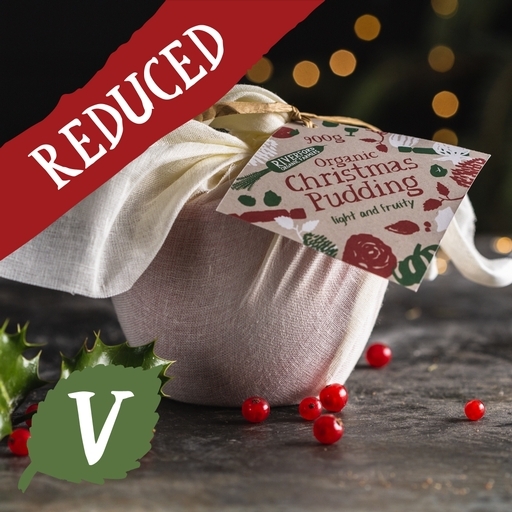 Unlike many Christmas puddings, which can be heavy and hard-going, ours is wonderfully light, fruity and fresh-tasting. Grated Riverford carrots and apples with warming brandy, golden syrup, spices, and a generous mix of other fruits go into this magnificent pud. It’s too good for December alone – and nearly gone! Eat your fill before it disappears for another year. Now reduced - previous price £18.25. Remove label. Steam pudding in its muslin-wrapped basin for 2 hours. Flame with brandy, and serve with generous dollops of clotted cream or brandy butter. Our Christmas puddings are made for us from scratch by Crosbies, a family-run bakery who only use high-quality, natural ingredients. The recipe is our own, specially developed to be lighter than the traditional Christmas pud. Sultanas, brown sugar, carrot, apple, self-raising wheat flour, breadcrumbs (wheat flour, salt*, yeast*), raisins, currants, butter (milk), sunflower oil, mixed peel (orange peel, corn glucose-fructose syrup, cane sugar, lemon peel, lemon juice), marmalade (raw cane sugar, oranges, lemon juice, fruit pectin), eggs, golden syrup, brandy, lemon juice, milk, nutmeg, cinnamon, mixed spice (coriander, cinnamon, ginger, nutmeg, caraway, cloves), grated lemon zest. Prepared in a kitchen where nuts are also handled.